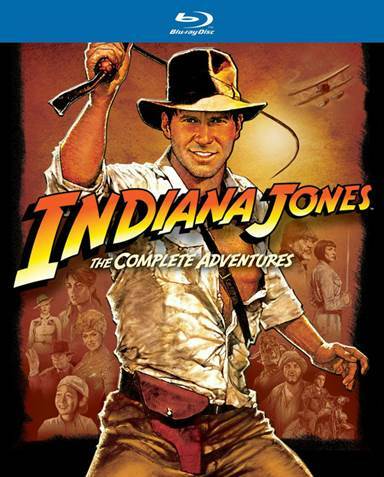 Indiana Jones: The Complete Adventures Is An outstanding set of Action Adventure film on Blu-ray. It's time to see one of the best movie franchises of all time in your own living room. Now on Blu-ray in a box set, the Indiana Jones series can be seen in all their adventurous glory, and in crystal clear High Definition perfect for home viewing. If you missed them when they were released in a theater or feel it's time to revisit the daring archeologist, I found Indiana Jones the Complete Adventures 5 Disc Blu-ray Box Set the best way of getting reacquainted. I became a fan of Indiana from the release of Raiders of the Lost Ark in 1981 amidst all the fan fare that the movie has Star Wars beat for excitement. Being an avid moviegoer I became a little skeptical as I had just seen The Empire Strikes Back an amazing sequel to its initial movie three years earlier. I had no idea that what I was about to witness was an amazing mix of adventure and comedy that blew me away. Even today when I watched the film in Blu-ray for the first time I just couldn't stop enjoying Harrison Ford as a young man determined to complete his quest. The Box set has all four of the motion pictures and I had no trouble plopping each of the discs into my Blu-ray player and getting totally immersed in each of the films once again. The 5 discs are slotted inside a book that has photos of posters and scenes from each of the films. Snugly inserted it takes a tug to get them out so be careful when you grab on to the awesome platters. I am glad they do not fall out easily and are nicely protected. The first four discs are the films each of which has their original trailers as a bonus. There is no waiting after you insert the disc into the player because it goes straight to the menu where you have a choice of play, settings, scenes or bonuses. I like this because you're not bothered by pitches for other films coming out, notices about the movie studio's rights or other annoying ads. This made it easy to jump right into the film and get started on each of the four action adventures. Let's get down to business, Raiders of the Lost Ark begins in the mid 1930's with the introduction of Indiana Jones (Harrison Ford) going after a golden artifact in a cave. Mixing a little comedy with a lot of action, the scene is probably the most memorable of all time. The story goes on from there where Indiana gets a job for the US Government to find the Ark of the Covenant believed to be the chest containing the Ten Commandment tablets received by Moses. Indiana has to find the Ark before his arch nemesis Rene Belloq (Paul Freeman), who has been commissioned by the Nazis, gets to the chest. Believed to have explosive powers, the Nazis want to get the Ark to help them dominate Europe and then the world. He travels to Asia where he meets up with Marion Ravenwood (Karen Allen) who gives him a piece to the puzzle. The movie is played out on a grand scale in many countries from Asia to Africa and keeps the viewer intrigued and amused. Following the huge success of the first entry into the movie market, Creator and Executive Producer George Lucas got Steven Spielberg and his leading man back again to make Indiana Jones and the Temple of Doom. The story actually takes place prior to his trek to get the Ark of the Covenent. Here we find him delivering an artifact to a Chinese mobster and just getting out of a double cross in the nick of time. Escaping in what he thinks is a transport airplane with Willie Scott (Kate Capshaw) and Short Round (Jonathan Ke Quan) in tow, Indiana ends up in the mountains of India. Here he gets involved in retrieving the magical Sankara Stones and giving them back to the villagers who were plundered and enslaved by Mola Ram (Amnrish Puri). I like all the adventures of Indiana Jones, yet Temple of Doom is one of the best for their action sequences that include a wild ride on an underground ore transport railroad. In the movie Indiana Jones and the Last Crusade which jumps back in time to introduce you to the young Indiana (Played by River Phoenix) we find out why he has a fear of snakes, how he got his whip and famous hat. But the real story takes you on a whirlwind trip to find the Holy Grail. Again encountering the Nazis who have their sights set on getting the challis that holds the powers of the universe, Indiana presses on getting special help to fend off the German scourge of the 30's. During this adventure we get to meet Indiana's father Henry Jones (Sean Connery) and Dr. Elsa Schneider (Alison Doody) who ‘help' Indiana on the treacherous quest. The action gets fierce and frequent as the Joneses fend off their adversaries and escape from some tight situations. This has to be the best film of the four using some amazing stunt work, great green screen special effects and explosive confrontations. The final film in this series Indiana Jones and the Kingdom of the Crystal Skull takes you on a very different kind of adventure. This outing gave me the impression that with the advent of CGI Spielberg felt he could give Indiana more of a fantasy stage to work on that was previously not available. Set in the mid 1950's Spielberg puts the now aged Indiana in harm's way after a relative Mutt Williams (Shia LaBeuf) visits him with an irresistible plan. Taking off on Mutt's motorcycle, the two head off on a Journey that leads them to parts of the United States, Peru and the Amazon Jungle where they discover the meaning of the Crystal Skull. Along the way they meet Irina Spalko (Kate Blanchette) a Russian who wants to get her hands on the crystal skull for the Soviet Union. The film also reunites Indiana with his first love Marion (Karen Allen) from Raiders of the Lost Ark who provides Indiana with some important news. Of the four films, this one may be the weakest, even though most visual with the use of Computer Graphics. While each of the discs have the bonus of the early trailers used to promote the films, the 5th disc holds the treasure of approximately 7 hours of features that are totally entertaining and eye-opening. Showing how each of the movies were created, developed, and filmed, the special added reflections by George Lucas, Steven Spielberg, the actors, and major crew give a fascinating portrait of the franchise that amassed billions of viewers. On the set with Raiders of the Lost Ark- Included here are the actual filming of Spielberg as he makes the movie showing the treacherous terrain on which he had to work, shooting the scenes under poor conditions and giving his vision of the script. It's an amazing visual that shows the man of many caps and hats as he works at his trade in part A "From the Jungles to the Desert" and part B "Adventure to Legend". The next bonus is a series called "Making Of" that features all four films. Each feature includes commentary by Lucas, Spielberg, Lawrence Kasdan (Screenwriter) and Producer Frank Marshall. Included in every one are outtakes and deleted scenes. There are two Making of Raiders of the Lost Ark, one that was earlier filmed when they made the film and the second one that was produced for the Box Set. The Video Quality on a HD TV of the films using the Blu-ray format is awesome compared to earlier releases on DVD. The visuals are clear and bright and the presentation in widescreen gives the film a theater look. The sharp details can now be seen during the less illuminated scenes. The Audio Quality stands out on THX, a crystal clear sound that allows most any speaker system more than sufficient ability to make each of the films enjoyable. I can hear more depth of sound and there's better support for additional speakers to make the action more real. Download Indiana Jones: The Complete Adventures from the iTunes Store in Digial HD. For more information about Raiders of the Lost Ark visit the FlickDirect Movie Database.